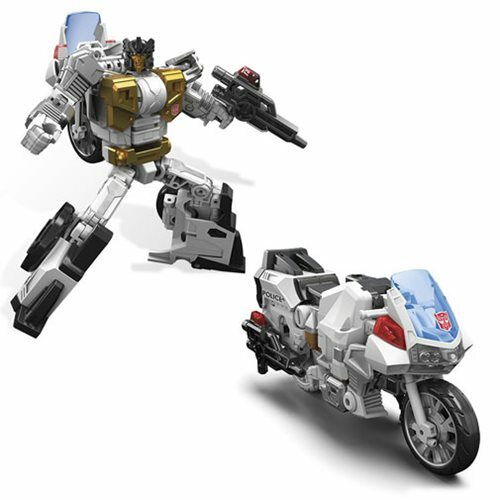 Go out on a limb and combine your forces with the Transformers Generations Combiner Wars Deluxe Groove figure! Transforming from motorcycle to robot to leg to arm, you've got a lot of options to play with this toy alone or you can unite him with other warriors. Display it in vehicle mode, robot mode, or as a limb of the super robot Superion! Ages 8 and up. Groove can join any Combiner Wars combining robot team, but will feel the most at home with Defensor and Sky Reign, and comes armed with a collector's card, two rifles, and a specially designed piece that can become a hand, a foot, or a gun. Ages 8 and up.